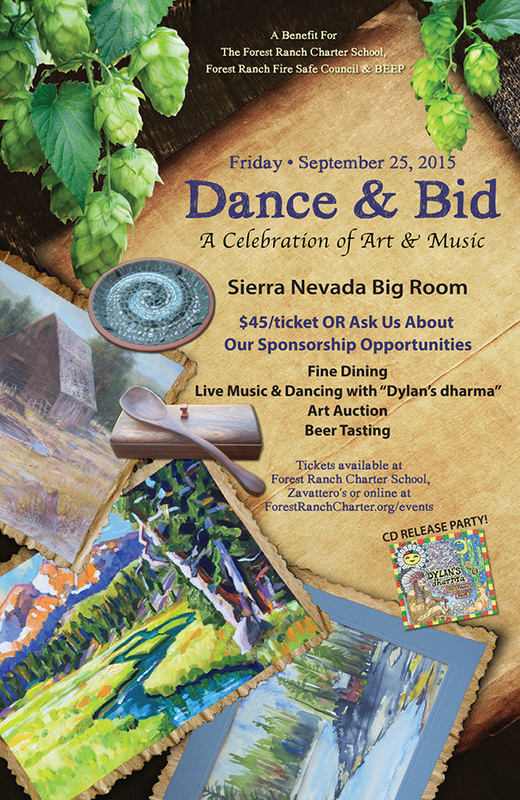 Dinner, dancing, live music, live and silent auctions - come join the fun on Friday, September 25th at the Sierra Nevada Brewery Big Room. This event is a joint FUNraiser for the Forest Ranch Charter School, Broom Education and Eradication Program, and the Forest Ranch Fire Safe Council. Purchase tickets online below, the Forest Ranch Charter School office or The Store in Forest Ranch. There will be silent, live and online auctions for interesting items such as custom wood wares, jewelry, paintings, art photographs, ceramics, bird houses, desserts, and much more. Tickets are $45 per person and there will be a door prize drawing for a $100 Sierra Nevada gift card. To reserve a table for 4, 6 or 8 people please contact Event Coordinator Marlene Heisey at 530-592-6613.